Beevers said other organizations on campus also have the opportunity to get involved and fundraise for BronchoThon by signing up and having teams participate. Some of these organizations include Greek organizations, Housing and Dining, President’s Leadership Club, Leaders of Tomorrow, Public Relations Student Society of America and E-Sports, among others. 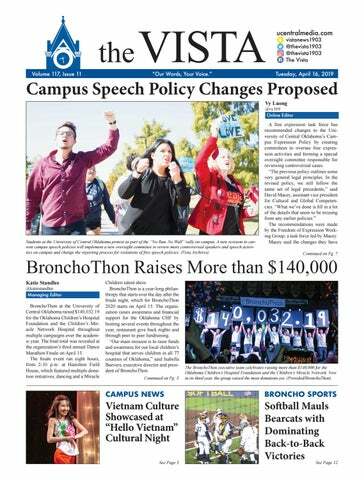 In 2016, BronchoThon became UCO’s largest student-led fundraiser. Last year, the organization raised $97,504.61, and including the amount this year, the total funds raised through BronchoThon is $305,941.80. “[BronchoThon] being throughout the year really gives students the opportunity to get involved at whatever stage they are at in their college career,” said Riley McKinney, vice president of BronchoThon. “There also are so many opportunities to meet the families, like when BronchoThon hosts events the kids can come, as well as go to the hospital and tour the facility to kind of see what you are impacting.” According to BronchoThon’s webpage, part of the reason BronchoThon was created is that the Oklahoma CHF is the only non-profit organization in Oklahoma whose sole focus is the advancement of pediatric research and educational programs to improve the health of children. hospitals across the country under it,” Beevers said. At the beginning of the finale night, Beevers said that the reason for standing and dancing for eight hours was to represent a portion of the 12-hour shift that a nurse typically works. “We dance and we stand for 8 hours, but we are also creating miracles so it’s so much more than dancing,” Beevers said. “That’s really important to remember while you guys are here, because you guys are going to get tired, and you’re going to want to quit, but just remember those nurses who are on their feet for 12 hours, working hard to make sure that those kids are getting the treatment that they need.” There were also eight families present who have been impacted from the CMN Hospital, and each family had time to give a speech and share their experiences with CMN and the benefits of receiving care directly in the state. Multiple tables were set up around the event with different options to donate throughout the evening, such as a dare table and merchandise table. An incentive table had varied incentives based on certain donation amounts. Applications for the executive team in BronchoThon closed Monday; however, for students who want to get involved in next year’s BronchoThon team, applications are open on OrgSync for leadership positions and will close on Friday. nization that represents those from Southeast Asian Nations who were once underrepresented on campus.” ASEAN Night will feature a fusion of traditional and modern performances from different Southeast Asian countries that some UCO students might not be familiar with, according to ASEAN President Shi Qi Ting. “It will be a night filled with dances, songs and free Thai food,” said Ting. “We found that many UCO students’ view of Asia is limited to East Asia like China, Japan and Korea, but Asian culture is very diverse and ASEAN has a unique culture that we are proud to present for the very first time on the UCO campus.” As an organization, ASEAN promotes intergovernmental cooperation between its member nations and represents Malaysia, Vietnam, the Philippines, Brunei, Laos, Thailand, Cambodia, Singapore, Myanmar and Indonesia. more of the students from the other countries that fall under the ASEAN umbrella, according to Ting. “ASEAN can be improved by continued growth, which is a goal of ASEAN and they hope to involve more students from Southeast Asian Nations as well as those students who are interested in learning more about different cultures,” Daine said. However, at the same time, Ting said she is worried about whether the association is going to last. There is no students from Brunei on campus and the number of Southeast Asian international students on campus is relatively small. She said they have also included students who are Asian American and has reached out to them as a way of sustaining the organization as well. “I just want ASEAN Student Association to be the platform for students who are unrepresented and for their voices to be heard,” Ting said. Alliance for Equality will host their annual Pride Picnic from 7-8:30 p.m. at Edmond’s Fink Park. The event will feature a cookout at the park’s North Pavilion and will celebrate the organization’s accomplishments over the last year. Wednesday, April 17, 2019 I Heart Central Week - Parking Lot Invasion: As part of I Heart Central Week, the Student Programming Board will be available to apply UCO stickers to students’ cars from 7:30 a.m. to 1:30 p.m. in parking lots across campus. Take Back the Night: The National Organization for Women will host Take Back the Night from 10 a.m. to 5 p.m. in the Blue Tent by Broncho Lake. The event will feature art and information concerning Sexual Assault Awareness Month. game from 11 a.m. to 1 p.m. in the Nigh University Center Food Court. The event will educate attendees on interpersonal violence as part of Sexual Assault Awareness Month. LLSC 11 Information: The UCO English Society and UCO Language Society will host an informational session on how to get involved with the eleventh annual Language and Linguistics Student Conference from 11:40 a.m. to 12:50 p.m. in Liberal Arts Room 139. Non Traditional Student Support Group: This group is designed to help non-traditional students find support at UCO with other students who can relate to your life experience and share resources to help meet personal needs and ensure success at UCO. The meeting is from 2-3 p.m. in Nigh University Center Room 322. E4E Legislative Advocacy Training: UCO’s Empowerment for Excellency will host a legislative advocacy session from 11 a.m. to 1 p.m. in Nigh University Center Room 326. The event will provide tips, discuss the legislative process and connect attendees with resources to improve advocacy. Earth Day Fair 2019: The Office for Sustainability will host their annual Earth Day Fair from 10 a.m. to 2 p.m. around Broncho Lake. The event will feature informational booths from on-campus organizations, community partners involved with sustainability and environmental organizations. I Heart Central Week - Swap for Pride: The Student Programming Board will trade students new UCO hats in return for lightly used clothing from 11 a.m. to 1 p.m. at the ClockTower near Broncho Lake. I Heart Central Week - Swap for Pride: The Student Programming Board will trade students new UCO gear in return for lightly used clothing from 11 a.m. to 1 p.m. at the ClockTower near Broncho Lake. p.m. on the Nigh University Center fourth floor. Suicide Prevention Training: The Peer Health Leaders will host a session how to prevent suicide and intervene in suicidal situations from 4-5 p.m. in Thatcher Hall Room 343. SPB Healthy: The Student Programming Board will host a healthy cooking session from 6-8 p.m. in the Quad Kitchens. The event is geared toward providing students with healthy cooking tips and recipes. Friday, April 19, 2019 Chill Skills: This group works to reduce conflict in your life: identify triggers, patterns and purpose of anger; gather more tools for enhancing communication, boundaries and healthy relationships. The group meets from 9:30-10:30 a.m. in Nigh University Center Room 322. LGBTQ Support: From 1-2 p.m. in Nigh University Center Room 322, the Center for Counseling and Well-Being will host a support group for those considering coming out as lesbian, gay, bisexual or transgender, and those who have recently come out. Anyone who identifies as LGBTQ, is questioning or unsure can meet and talk about various topics. A Life Worth Living: This group works on skills for improving boundaries and strengthening healthy relationships, enhancing sense of self and ways to manage distress. The group meets from 2-3 p.m. in Thatcher Hall Room 328. Constitution Hall. According to Hing, the support behind Thai Tea Tuesday is something the Asian American Student Association hopes to carry on every year. "All of this is to raise funds for a philanthropy called Teach for Malaysia, which aims to provide education to the rural parts of the country," Hing said. "We hope in future years to rotate through different philanthropies to bring aid to a variety of Asian countries and show that not only does the Asian community at UCO care about its fellow students and the university, but aims to have an impact on a global scale as well." model of the car that was supposed to pick us up. It was actually a man waiting to pick up a family member. We all had a laugh, but there’s no telling what could have happened if the guy tried to act like he was there to pick us up.” Uber is spreading awareness by purchasing ads in college papers with a “Check Your Ride PSA,” and promoting an in-app Safety Center to all riders in the US. Tyler Coffman, an Uber driver since 2015, said an important part of driver safety is remembering that “No” is an option. “If you pull up and see something you’re uncomfortable with or get a weird vibe from, just cancel and drive off,” Coffman said. “If ending a ride early is best, pull over to a public place, get out and inform them the ride is done and to get a different Uber.” Coffman said ending a ride early is something he has yet to do, but having that plan of action gives him peace of mind on the job. ers are said. But I was confused because for Google to hear me say “Ok Google,” doesn’t it have to always be listening? I wondered if other devices like the Alexa or Echo also recorded requests. It turns out they do; in fact on Thursday, Bloomberg reported, “Amazon Workers Are Listening to What You Tell Alexa. A global team reviews audio clips in an effort to help the voice-activated assistant respond to commands.” Basically, they’re people who sit and listen to commands and request all day long, looking to improve the technology. “You don’t necessarily think of another human listening to what you’re telling your smart speaker in the intimacy of your home,” said Florian Schaub, a professor at the University of Michigan who has researched privacy issues related to smart speakers. “I think we’ve been conditioned to the [assumption] that these machines are just doing magic machine learning. But the fact is there is still manual processing involved.” So for about a week, any time I spoke to my Google Home, I would get the feeling of some stranger listening to my request and that made me a bit uncomfortable. It felt like there was a personal spy in my house. My speaker has essentially been laid off. I have unplugged it and moved it to the back room. Occasionally I will use it to play music, but other than that it is unplugged. I can just use my phone to look up enchilada recipes. propriate agencies on campus such as UCOSA, Staff Senate [and] Faculty Senate will work together to come up with the details of it.” In the spring 2018 semester, UCO had a controversial issue regarding free speech when UCOSA invited creationist Ken Ham as part of their speaker series program. Concerns were raised by the Women’s Research Center and BGLTQ+ Student Center around using student activity fee funding to bring Ham due to his comments on the LGBT community and women, as well as his views as a creationist. 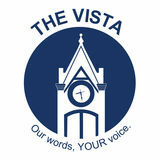 After the invitation was rescinded by then-UCOSA president Stockton Duvall, Betz made the final decision to reinvite Ham back and hosted a series of events regarding freedom of expression. “We are aware of that and other incidents that happened at other campuses to see how well the policy will address in those cases. [The Ken Ham incident] is probably the impetus,” Macey said. “But the best practice in university policymaking is to come back to these things every so often anyway, because the legal context changes, the social context changes and the communication context changes, so we need to keep updating.” According to the committee’s proposal, the current Campus Expression Policy was developed and implemented in 2017-2018 without any input of the Staff Senate. After the forum, the Freedom of Expression Working Group will finalize the policy and submit it to the president and the President’s Cabinet, who will then decide to approve and implement it. Macey said the policy may be implemented during the next school year. were no reported deaths. Flames shot out of the roof behind the nave of the cathedral, among the most visited landmarks in the world. Hundreds of people lined up bridges around the island that houses the cathedral, watching in shock as acrid smoke rose in plumes. The fire came less than a week before Easter amid Holy Week commemorations. French President Emmanuel Macron was treating the fire as a national emergency, rushing to the scene and straight into meetings at the Paris police headquarters nearby. Deputy mayor Emmanuel Gregoire said emergency services were trying to salvage the famed art pieces stored in the cathedral. Built in the 12th and 13th centuries, Notre Dame is the most famous of the Gothic cathedrals of the Middle Ages as well as one of the most beloved structures in the world. Situated on the Ile de la Cite, an island in the Seine river, the cathedralâ&#x20AC;&#x2122;s architecture is famous for, among other things, its many gargoyles and its iconic flying buttresses. a wild pitch, which was followed by an RBI double from Puempel. Bailey Thompson answered with a double of her own that put Puempel on third and Hailey Randolph walked to load the bases. JoBi Heath hit a grand slam to send everyone home and put the Bronchos up 6-1. With that home run, Heath moved into third place on UCO’s all-time scoring list with 35 and now has 200 career RBIs, second best in school history. Freshman pitcher Bailey McKittrick took care of business on the mound picking the win, improving to 18-1 with eight hits, four strikeouts and zero walks at-bat. The Bronchos came out strong in game two, which ended in an 8-0 run rule at the bottom of the sixth inning. Lexi Dobson led the charge with a three-hit outing followed by Carli Jones and Thompson, who both contributed two hits each. make it 2-0. Next at bat, Gilbert hit a sacrifice bunt to move the runners over, followed by Puempel’s sacrifice fly and Thompson’s single to right field that sent in the final two runs. UCO extended their lead to 7-0 by the end of the fourth inning. The game ended in the sixth inning. Pinch-hitter Tori Huslig hit a one-out single through the left side, Heath followed with a single to right field. Huslig advanced to third on a Jones fly out before scoring the game-ending run on Dobson’s base hit to right that prompted the 8-0 run-rule completing the sweep against SBU. Sydney McLeod picked up the pitching win for the Bronchos, giving up just two hits going into the first five innings. She didn’t walk a batter and struck out two, improving to 15-2 before Lauren Gibson came on to throw a one-hit sixth inning. After a 19-12 season, the University of Central Oklahoma women’s basketball team signed seven new incomers to the 2019 class. The Bronchos look to add more depth to support the season scoring leaders Macayla Haynes, Shatoya Bryson and Ireon Smith, who will all return for their senior season. In the offseason, the Bronchos graduate two starters, Madison Lee and Blake Blessington along with the sixth man Megan Hartness. Blessington appeared in 122 games for UCO. “I think we put together a really solid recruiting class that will fill the needs we have going into next year,” said head coach Guy Hardaker. “I think each one of them will find a role pretty quickly and they can all really help us.” In the 2018-2019 season, the Bronchos were overcome by multiple injuries that forced them to start the season with only 11 active players. “They’re playing well together,” Hardaker said before the 2018-19 season. “To be real honest, they’re not very big, but they’re pretty athletic and pretty fast.” The Bronchos will bring in size, as four of the signees are around six foot. The University of Central Oklahoma Bronchos traveled to Tahlequah to take on the Northeastern State University Riverhawks for a three-game series. the doubleheader, 12-10. The Bronchos had a slow start to the game going down 9-0 after three innings of play. Spencer Van Scoyoc got the start for UCO and was chased after 1 2/3 innings. He allowed four runs on two hits and six walks and one hit batter. Van Scoyoc struck out one in his appearance. Brent Stephens came in for Van Scoyoc in the second and expected the inning, but he allowed four runs on three hits in 2/3 of an inning before Martin had to make a change. Avila was hit by a pitch and Brock Ruminer drew a walk. Then Brock Schaffer came into the box and struck a 0-2 pitch down to right field to score both Kropf and Avila and make it 9-5 NSU. After Northeastern got the first out of the inning, Black hit a deep fly ball to left field and earned a sacrifice fly as Ruminer darted home to make it 9-6. NSU added one more run in the bottom of the eighth, and UCO’s comeback fell short in the ninth inning. The Bronchos have one more road game on their eight-game road trip. UCO heads to Southeastern Oklahoma State University on Tuesday, then comes back to Wendell Simmons Field for another three-game Mid-America Intercollegiate Athletics Association series next weekend against Fort Hays State University. Central is 24-13 on the season and 14-10 in MIAA play.